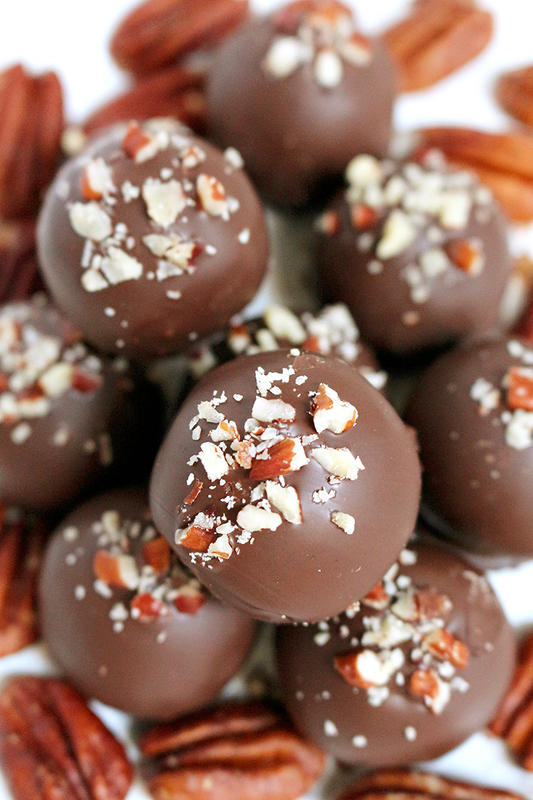 If you like chocolate, pecans and caramel sauce, I have a special recipe for you – Caramel Pecan Truffles. Do you like the smell of baked pecans? I am baking them right now, because I am planning to make a special dessert, we all like. 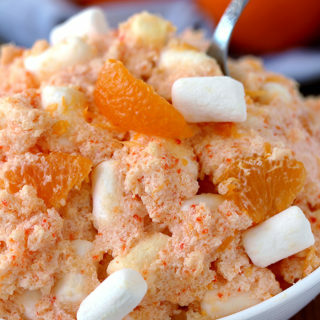 A special dessert, for special occasions, like Thanksgiving Day, for example. 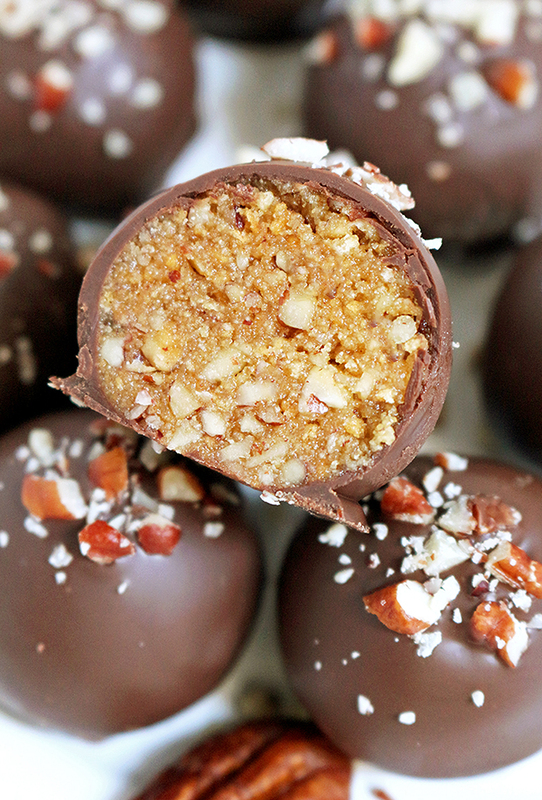 I adore Caramel Pecan Truffles because they are easy to make, they look great, and taste even better. As usual, I have my little helper – my son is always by my side. We mix ingredients together; he makes the truffles (with my help, of course). He likes to help me in the kitchen and we usually make chocolate sweets. He always patently waits for the chocolate leftovers, because he is a true fan. I do the coating of the balls and he covers them with chopped pecans and says that they look fantastic. 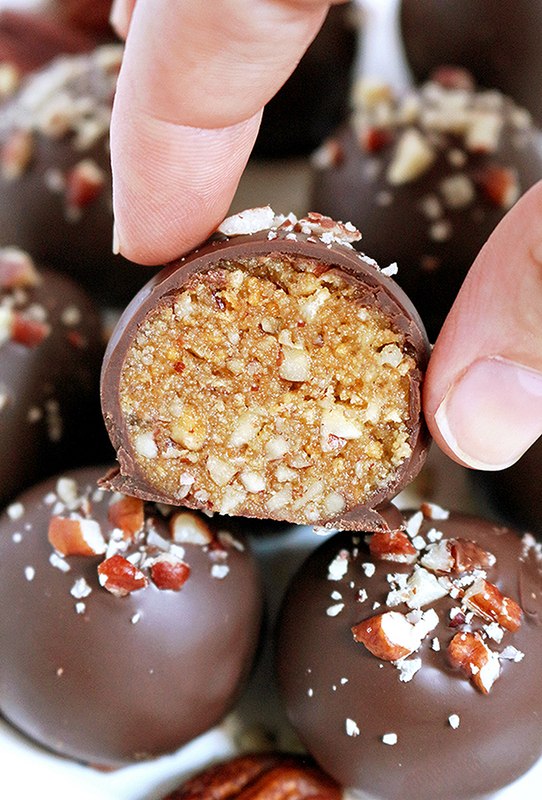 He is always so proud when we finish, and so am I. Caramel Pecan Truffles can be stored in a fridge or a freezer. If you like chocolate, check out my popular recipes on the blog Chocolate Chip Cheesecake Cookies and No Bake Chocolate Peanut Butter Mini Cheesecake. If you like pecans, try some of these: Peanut Butter Cookies with Chocolate Chip and Pecans. If you have no idea what to prepare for Thanksgiving, here is an idea: No Bake Pumpkin Oreo Cheesecake and Pumpkin Walnut Bars with Cream Cheese Frosting. Caramel Pecan Truffles are finished; we are waiting for my husband to come home from work and to enjoy eating them, together. Enjoy! 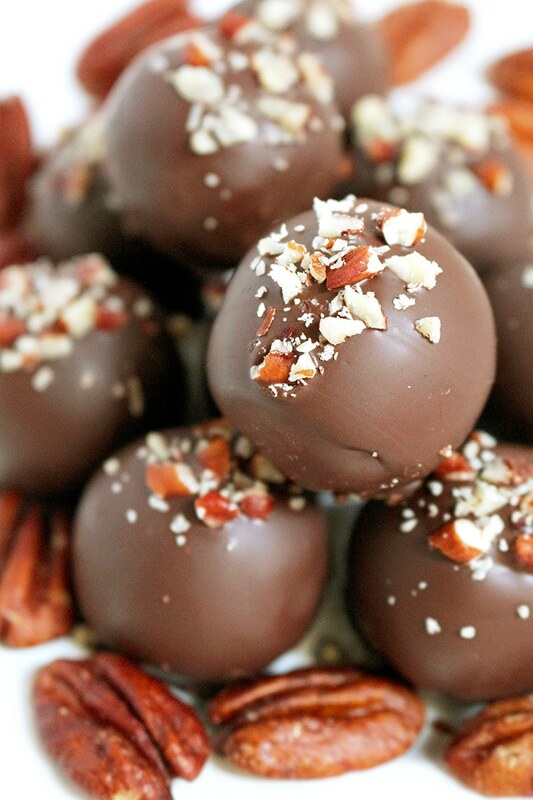 If you like chocolate, pecans and caramel sauce, I have a special recipe for you - Caramel Pecan Truffles. Do you like the smell of baked pecans? Preheat the oven to 350 F. Line baking sheet with parchment paper. Put chopped pecans and bake for 4- 5 minutes, until fragrant. Leave them aside, to cool. In a medium dish, combine graham cracker crumbs and melted butter. Add light brown sugar, salt, caramel topping and cooled pecans and mix until well combined. Put parchment paper in a baking sheet. Make balls - 1 tablespoon – 1 ball. Place the balls on the parchment paper. Chill for about 30 min. Melt chocolate and put it in a small deep bowl. Add oil and stir. Take the balls and coat them in the melted chocolate, using a fork. Take the balls out with a fork and wait for a couple of seconds for the extra chocolate to drain. You should be quick, if you want the truffles to keep their shape. Take the balls off the fork using a smaller knife or a toothpick and place them back on the parchment paper. Quickly sprinkle with pecans. Repeat with remaining truffles. 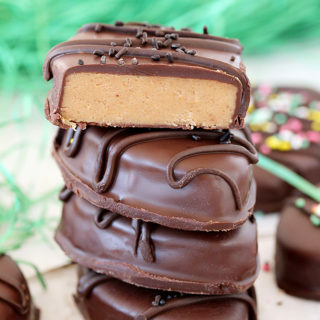 Put them in the freezer for 10 - 15 min, until the chocolate sets. 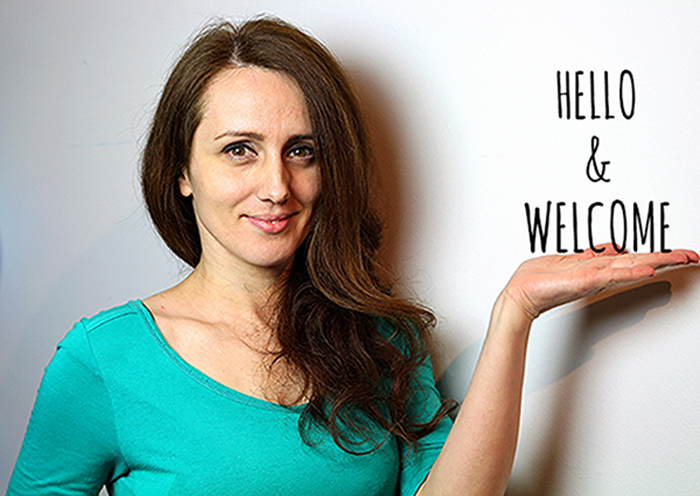 Your truffles are adorable Dragana! I can literally imagine how they break when I take a bite. Thank you for sharing these wonderful photos! Step 1. Preheat the oven to 350. Is this really necessary since there is no baking involved? Maybe I’m missing something here. Also, I’ve made truffles before and never baked them. 2. Put chopped pecans and bake for 4- 5 minutes, until fragrant. This sounds delicious and able to be made without much fuss. 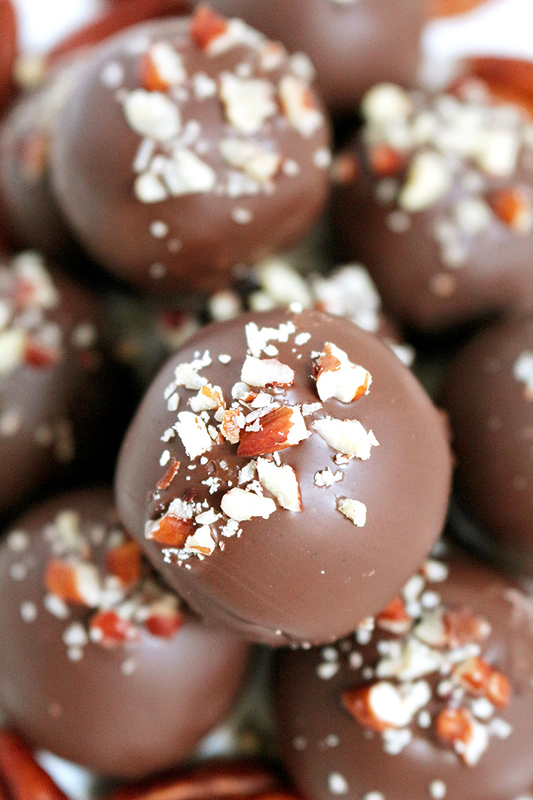 These delectable truffles were a hit. I made them for an office competition and won 3rd place! I just finished making a new batch for Thanksgiving and added a little bourbon! 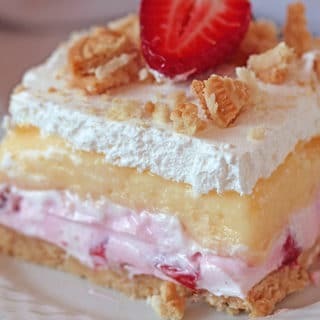 I’m making these for my mom for mothers day and I’m sure they will come out great I love this recipe thanks. Glad to hear that Lamia.